As Intel and AMD near the end of the discovery process in their US antitrust battle, the two companies have begun fighting over whose testimony will make it to the big dance. In a legal filing, AMD has pointed to the employees at some of the technology world's biggest names - HP, Dell, IBM and others - who it thinks will help make its case. Intel has responded in kind, and it's now up to a judge to decide on the strength of the vendors' arguments. Following a dispute over the number of depositions allowed in the case, Special Master Vincent Poppiti appointed to hear evidence from both companies ordered up a pair of "preliminary pre-trial briefs." Well, it's those very briefs which have now been turned over to the press. AMD's beefy filing claims to offer new evidence to support the original accusations filed back in 2005, at the U.S. District Court in Delaware. "The current brief reflects that the allegations are more than allegations," said AMD spokesman, Michael Silverman. "The evidence exists." Unfortunately, most of this purported evidence has been redacted from the public version of the brief. 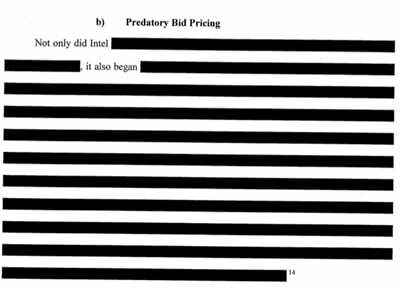 Both companies had previously signed a confidentiality order to guard trade secrets, making for long, tantalizing passages buried behind this kind of nonsense and more of it in AMD's latest 108-page summary. What can be gleaned from the filings are the companies that AMD claims have been influenced by Intel's anti-competitive behavior. AMD fingers a laundry-list of major OEMs: Dell, Hewlett-Packard, IBM, Lenovo, Gateway, Acer, Sony, NEC, Toshiba, Fujitsu, and Hitachi as holding anti-competitive, exclusive arrangements with Intel. It also calls for testimony from smaller builders such as Supermicro and Rackable. All the sections covering these vendors are heavily censored, however, making it hard to grasp anything beyond that AMD claims to have acquired specific evidence of misconduct. While not exactly enlightening, the scant passages left uncensored seem to indicate AMD has narrowed its grievances to certain names and faces within the organizations. 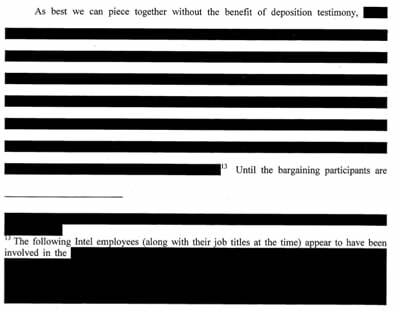 AMD provides similar censored lists of employees wanted for deposition in most of the companies it names. Oh — for X-ray eyes. Thankfully, the protective order is only applicable in the courtroom's discovery phase. Much of the information will eventually be made public during the actual trial. Until then, we'll be playing Mad Libs. That said, a few snippets from AMD's brief catch the eye.